Honieh Udenka is an associate in Brown Rudnick’s Commercial Litigation Group. 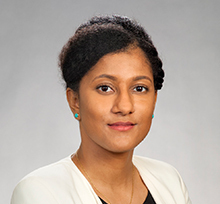 Prior to joining Brown Rudnick, Honieh was a summer associate at Munger, Tolles & Olson, where she drafted client and internal memoranda. As part of the Appellate Litigation Clinic at UCI Law, Honieh worked with others to brief and argue a case before the Ninth Circuit Court of Appeals. Additionally, Honieh worked on several Alien Tort Statute cases as part of the International Human Rights Clinic at UCI Law, helping to draft both trial and appellate briefs. In law school, she served as the President of the Business Law Society, and sat on the board of the Underrepresented Students’ Alliance.